Dave recently sat down with WWD where he spoke about The Disaster Artist, watching The Room and his family. The full interview can be found bellow and under the cut, plus we’ve added outtakes from the photoshoot to the gallery. 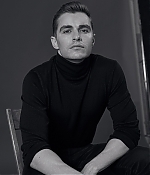 Dave Franco has racks of Givenchy, Saint Laurent, Ralph Lauren and Gucci set out before him — and an awards season-bait film to discuss — but before he can get to that, there are cat videos to be seen. When the topic of feline companions comes up mid-shoot, a small frenzy ensues. Franco pulls up a video on his phone: The camera pans over to the two striped tabbies, brothers Harry and Arturo, lovingly grooming each other. It’s another side of the youngest Franco brother, who is perched for a major breakthrough. 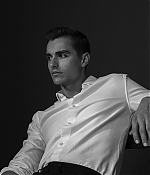 Franco arrives to his photo shoot wearing black jeans and a vintage-style T-shirt from Kelly Cole’s Los Angeles flagship, near where he lives with his wife of half a year, actress Alison Brie, and, yes, two cats. The 32-year-old is polite and approachable, friendly but reserved in the way many actors are while in the thick of press — and for his latest project, there’s been a lot of it. Franco and his brother, James, are the stars of “The Disaster Artist,” a quirky biopic about the relationship between two best friends, actors Greg Sestero and Tommy Wiseau, who costar in “The Room.” The film is regarded — unofficially — as being the worst film ever made since its 2003 premiere. “The Disaster Artist” follows the events that led to its creation, beginning with Sestero and Wiseau befriending each other during an acting workshop in San Francisco before moving to L.A. When roles failed to pan out, Wiseau wrote — and independently financed, produced and directed — a film for him and Sestero to star in. The film tanked, before taking on a new life on the midnight movie circuit. Similar to “The Rocky Horror Show,” the film has developed a cult following: A typical screening elicits dressing up, tossing footballs and, yes, throwing spoons at the screen. Despite all of the gimmicks during screenings of the original movie, the intention of “The Disaster Artist” was to laugh with Wiseau and Sestero, not at them. Although panned for its quality of acting, directing, and disconnected plot, “The Room” was intended by Wiseau to be a serious, award-contending film and a breakout moment for Sestero. And in a roundabout way, the two men were successful, although not how they could have ever originally imagined. “We wanted this to be a love letter to the movie, and we wanted it to be a celebration of people who go after their dreams and don’t take no for an answer,” Franco says. “As weird as their story is, I can absolutely relate to it. And I know that most people who have ever tried to do anything creative can relate to these guys’ struggles. His brother James has coined the film an “upside down ‘La La Land,’” referring to 2016’s acclaimed movie starring Emma Stone and Ryan Gosling — a very different pairing of personalities than Wiseau and Sestero. “The Disaster Artist” is the familiar “make it in Hollywood” tale as much as it is a love story between two best friends. So far, reception to “The Disaster Artist” has been overwhelmingly positive since it premiered at SXSW in March; in May, film distributor A24 picked up the film, and it screened again during the Midnight Madness portion of the Toronto International Film Festival. At this point, labeling “The Room” as “the worst movie ever made” is a misnomer. The film marks the first time that both Franco brothers have shared screen time (Dave’s wife Brie also stars), and with equal billing. 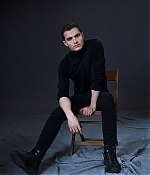 When he was an up-and-coming actor, working with the already established James may have seemed like an easy choice, but it’s one that Dave Franco avoided for many years — and yes, James has noted that his brother had turned down his offers. Not such a disaster, after all.